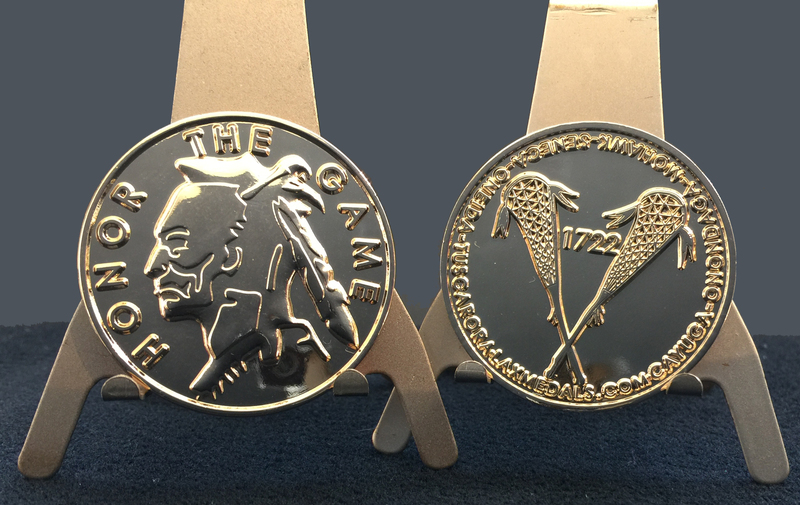 The Laxmedals.com HONOR THE GAME lacrosse referee flip coin was created to honor the Native American creators of the game of lacrosse. The 3D image of the Indian warrior is on the "heads" side with the words, "HONOR THE GAME." On the reverse, all the united Iroquois tribes are named with their union established date of 1722. This lacrosse flip coin is a beautiful piece for any lacrosse official and will be a noteworthy addition to any pre-game ceremony or game function. Materials: Solid brass core with polished brilliant gold plating. The Laxmedals.com stock BOYS ALL-STAR lacrosse medal is available for your immediate purchase. 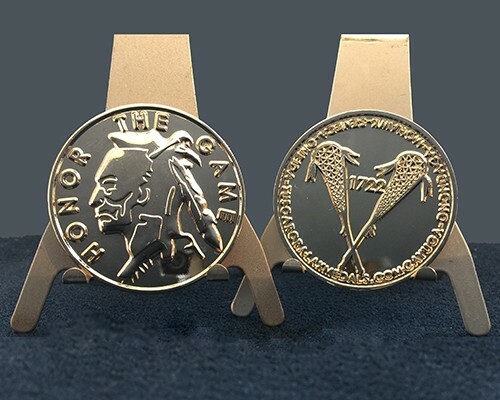 The medal features our trademarked 3D lacrosse art in polished gold with matt gold recessed color fill. A 38" x 1.5" red, white, and blue lanyard is included with each medal. The reverse is blank, but custom printing is available for an additional $4 per medal. If you require more than the available quantity please contact us for more information. Custom lanyards and additional colors are available with custom orders. Materials: Zinc core with polished gold plating with recessed matt paint. The Laxmedals.com stock GIRLS ALL-STAR lacrosse medal is available for your immediate purchase. The medal features our trademarked 3D lacrosse art in polished gold with matt gold recessed color fill. A 38" x 1.5" red, white, and blue lanyard is included with each medal. The reverse is blank, but custom printing is available for an additional $4 per medal.